To get things started, first some interesting numbers and statistics. July marked an important milestone because we released a new StackStorm native Workflow Engine called Orquesta which will replace Mistral in the future. Unlike Mistral, Orquesta is directly integrated into StackStorm. This offers a simpler deployment model (no more PostgreSQL, mistral-api and mistral-server services have been replaced with the new st2workflowengine service), better and more user-friendly experience, easier and faster debugging, better performance and more. Currently Orquesta is still in beta, but we are in the process of bridging the Mistral feature gap and incorporating feedback from our users. We would encourage you to have a look and try it out. Last year we released multiple improvements to our web interface. The biggest one was new and improved triggers tab. With this new and redesigned triggers tab, it’s now much easier to see if a trigger matched a rule (and which one) and if that match resulted in an action execution. This makes end to end tracing of triggers through the whole system much easier. For more information, please refer to the release announcement. In December we announced a preview of Ubuntu Bionic StackStorm packages which run all the StackStorm services under Python 3.6. This is an important milestone for us. We started to work on Python 3 support early on in the life of the project, but we have finally reached a phase in the middle of the last year where we now have all the unit, integration and end to end tests running and passing under Python 3. Currently we are in the process of testing StackStorm under Python 3 at scale and incorporating any user feedback and bugs which might be discovered. If you are interested in how the future will look like, we would encourage you to try out those new packages. If we don’t uncover any blockers, we plan to have GA packages out and ready either first or second quarter of this year. 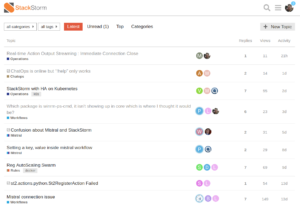 Late last year we released beta version of Kubernetes Blueprint (Helm Charts) for the community and enterprise version of StackStorm. 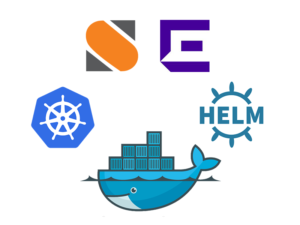 Helm Charts allow you to run StackStorm at scale in an HA manner using Docker and Kubernetes. It takes care of things such as automatic failover, load-balancing, scaling, HA setup for all the components and services (replication setup for MongoDB, master-master setup and queue mirroring for RabbitMQ, etc.) and more. In StackStorm v2.9.0 we announced new WinRM based Windows runners. Those runners will replace old winexe based Windows runners in the near future. Unlike old winexe based Windows runners, those runners are much easier to get started with (no need to install winexe binary anymore). In addition to that, they are also much more robust and stable because they utilize native Windows Remote Management (WinRM) protocol. Special thanks to our long time user and contributor Nick Maludy who has contributed this feature. We have nurtured a very vibrant and active community of helpful users on our community Slack instance, but one thing Slack is missing is permanence. Slack is great for asking quick questions and debating things in real-time, but since it’s real-time, most of the information is of an ephemeral nature. To support our community and users better we launched new StackStorm community forum – https://forum.stackstorm.com. On the forum users can ask questions and exchange ideas. Unlike Slack, answers to those questions and ideas will be archived, indexed and available to other users who might be facing the same issues. If you haven’t already, go check out our new forums – https://forum.stackstorm.com. To allow users to try out StackStorm easier and faster and to better support deployments in an isolated air-gapped environments, we released a new OVA based Virtual Appliance. Community edition is available as a VirtualBox image, but enterprise version is also available in other formats such as VMWare. 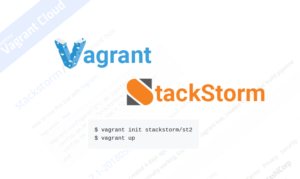 In addition to the Virtual Appliance, we also launched a new Vagrant image which allows users to quickly and easily try out StackStorm. You can learn more in the release announcement blog and and in the documentation. To be able to make 2019 even more successful we would like to learn more how you use StackStorm. This will allow us to prioritize features based on the actual user needs and make you more successful in the end. If you have 10 minutes to spare we would ask you to please complete our first user survey available at https://www.surveymonkey.com/r/st2-2019-user-survey. By default the survey is fully anonymous and we don’t collect any personal identifiable data. If you want to receive StackStorm stickers for completing the survey or if you are fine with us reaching out to you for any follow up questions we might have, you can chose to leave your email we can use to contact you.